If your house is like mine, you’ve been questioned for weeks about when Christmas break starts. Between school concerts, cookie exchanges and family gatherings, it won’t be long until winter break is here. Some schools are starting break with either a half day or full day off on Friday, December 21, while other districts are starting break on Monday, December 24. Most schools are returning to school on Monday, January 7, 2019. So what will you do with your two weeks of winter break? Our city is packed with a wide range of activities happening throughout Christmas break, sure to please everyone in my family, and yours, too. Use our guide to help plan your days and make Winter Break 2018 the most memorable one your kids have seen yet! This award-winning studio offers good clean fun for the whole family! All ages are welcome and no appointment is necessary unless you’re coming with a group or party. And don’t worry if you’re “not creative…” Their helpful staff will help anyone feel like an artist! During Winter Break you can stop in during Open Studio hours for an impromptu creative day out to paint pottery. The studio is open at 11 AM most days, but check their holiday hours before you head over. You can also register ages 7-15 for one of their popular Camp Mud Potter’s Wheel classes. Online registration is available at www.themudroom.us/camp-mud. But don’t wait too long, these classes sell out! Need a night out for yourself? The Mud Room can help with that, too! Sign up for a Potter’s Wheel class for adults, or schedule a night out with your friends for a Pallet Painting Party. Conveniently located at Knapp’s Corner, Open Studio is available most days for paint-your-own pottery and wood pallet signs. Seating is FCFS; table reservations are recommended for groups of 6+. The potter’s wheel is available during scheduled classes and pre-booked appointments only. Holiday events still left on your bucket list? Sneak in some of these festive activities over winter break. If your family loves the magic of the snow and twinkling lights this time of year, grab some hot chocolate, a few blankets, and take a ride around town checking out the Christmas light displays throughout your neighborhood. Not sure where to start? 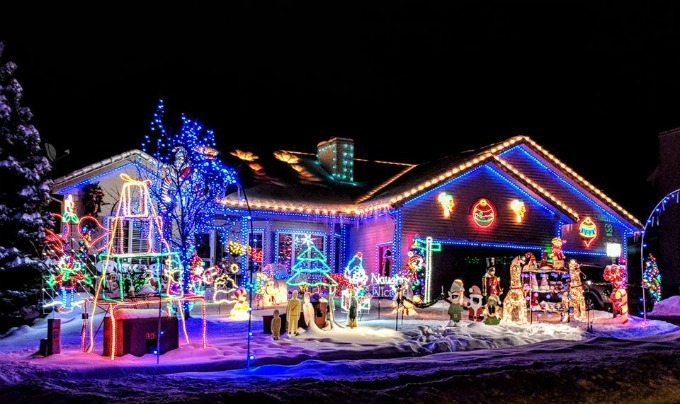 The GRKIDS Holiday Lights Tour lists houses with some pretty amazing light displays, all recommended by our readers. Or, you can see over a million lights twinkling while riding on the Memory Lane Train through the Christmas Lite Show at Fifth Third Ball Park. Safaris and Christmas, together? Why yes, at the Christmas Experience at Deer Tracks Junction. Not only will you find Santa, but visitors can take a Wildlife Safari tour with the Grinch! Or visit the Critter Barn’s Live Nativity where families can get a glimpse of the magic of the first Christmas. Stop in to Frederik Meijer Gardens and check out their Rooftop Reindeer. Afterwards, stick around and enjoy the Christmas and Holiday Traditions Around the World where you will find 42 internationally decorated trees and can explore the railway garden exhibition, a seasonal favorite in many households. Looking for something fun and ACTIVE for your kids to do during Holiday Break? MVP Sports Clubs offer day camps for kids ages 3-11 years old. Campers will enjoy themed projects and activities, swimming, sports, active fun and much more! Visit MVPSportsClubs.com for participating holiday camp locations. Michigan winters can be blustery and cold, but they are also beautiful. Soak up the beauty of the season with a Snowshoe Hike at Blandford Nature Center. Or take your family on an interactive Winter-Time Walk through the Children’s Garden at Frederik Meijer Gardens. If your family likes a little more action outdoors, grab a sled and spend the day flying down hills. Check out our Winter Outdoor Play Guide to find local sledding hills located all over West Michigan. Embrace the season at WinterWest, a celebration of all things winter, including sled races, snowman-making contests and plenty of outdoor winter activities. At BattleGR Tactical Games our goal is to provide a fun and entertaining experiences through strategic team on team games, bringing people and families together to create unforgettable memories. We have eight different objective based games, like being in the middle of your own video game. Check out our Facebook page or call us for details on special events during Winter Break. FortNite Day Camp – Laser Tag Style Dec 27th, Jan 2nd & 4th 10 AM – 2 PM – Includes Lunch! Wristband Day – Dec 26th 12-3 PM & 4 -7 PM – $15 All you can play! Call or make your reservation online. Baby It’s Cold Outside, So Let’s Play Indoors! If the cold weather has you rethinking life in the Midwest, there are still plenty of options to have fun AND stay warm over Christmas Break. Stop in at Gymco or Horizon Kids Complex during their open gym hours and take advantage of one of the many open gym options available over Winter Break. Or let them bounce and play the day away with indoor jungle gyms and inflatables at Jester’s Court. Want to get your Fortnite-loving kid out of the house? Check out BattleGR’s Fortnite Day Camp, Laser Tag style. Or check out laser tag (and maybe even some go-kart riding and ninja courses) at Craig’s Cruisers. Need some time to re-center yourself and your family after this busy holiday season? Sign up for Family Yoga at Renew Mama and have your family practice yoga poses, play games and reconnect. If you are longing for the 80 degree days of summer already, grab your bathing suit and spend the day splashing around at Holland Aquatic Center, where kids can go down a 150 foot water slide and re-live some of the joys of summer. An indoor water park, climbing wall, and game room are just a few of the family-friendly activities available at The Salvation Army Kroc Center during Christmas Break. Open recreation hours are extended to help parents make sure they never hear, “I’m bored!” Day passes are just $5.50 for ages 11 and under, $7.50 for ages 12 and up. Need childcare during break? Register for Christmas Break Camp! Camp Kroc activities including swimming, rock wall, Bible lessons, as well as special holiday activities and movies throughout each week. Visit GrKrocCenter.org for the schedule of Christmas Break activities and more info about Camp Kroc. Take a trip down memory lane and watch some of your favorite childhood characters perform in Sesame Street Live! Make Your Magic at Devos Performance Hall. Or spend the afternoon at your local movie theater taking in a family film. And, if you have someone in your family with special needs, check out a Sensory-Friendly Movie at Celebration Cinema, allowing everyone to enjoy the fun. Need a few laughs after a busy holiday season? Check out River City Improv for a night of laughter and entertainment. And even better, they aim to keep comedy non offensive, perfect for a family outing. Jester’s Court is West Michigan’s largest indoor child entertainment center, where the affordable cost of admission gets you unlimited play time. A place where kids can play and parents can relax! Our facility features action-packed fun for kids 12 years and younger (during open play), special family nights, and all ages (during private parties). Featuring a huge enclosed jungle gym, inflatable slides, obstacle courses, jumps, interactive games and more that will keep your kids happy, healthy, and active. Treat your toddler to Toddler Court (for children 3 and younger) where they will find a toddler-sized themed inflatable, safe play area, and friends their own age. There are lots of great ways to keep your kids learning while still having fun. Start with a trip to the Grand Rapids Public Museum and stop in for one of their Curiosity Labs where kids can enjoy science through a variety of hands-on activities. Looking for some budget-friendly activities over break? You can enjoy Family Night at the Grand Rapids Children’s Museum for $1.75 admission. Or, check out Free Thursday Nights at the GRAM offering free general admission. Or check out a camp! There is sure to be a camp to please every kid. Got an animal lover? Enroll in John Ball Zoo’s Winter Break Camp and experience winter at the zoo. Camp Mud at the Mud Room will teach your aspiring artist how to use a spinning Potter’s Wheel. If your kid likes a variety of options, like swimming, game playing or wall climbing, check out Camp Kroc School’s Out Day Camp or Holiday Sports Camp at MVP Sportsplex. Both will keep your active kids entertained during Christmas break. This winter, plan your visit to the Grand Rapids Children’s Museum and its latest exhibit THINK TANK. Imaginations run wild in this all-new exhibit as kids create with oversized blocks, piping, planks, nuts, bolts and rope that can be combined to link, lift, and launch. Kids can even plan and draw their creations in the THINK TANK drafting and design station! During your visit, you can also build a fort in JUST FORT FUN, create a giant bubble, find the queen in the beehive, and shop for groceries in LITTLE GR. Get out of the cold and join the fun at the Air Zoo during our Family Fun Days! Every Wednesday through Friday during winter break, there will be special activities for the family. Don’t miss our Countdown to Noon festivities on Monday, December 31st! Winter Break Family Fun Days: Wednesday through Friday, 11 am – 3 pm, during winter break. Only $2 per child with purchase of General Admission, while supplies last! Wednesday, December 26– CSI: North Pole Mystery – A jealous reindeer has kidnapped Rudolph after leading Santa’s sleigh Christmas Eve! Join the Air Zoo Bureau of Investigation to examine clues to successfully find Rudolph and bring the perpetrator to justice! Whodunit??? Thursday, December 27– Wonderous Weather – Baby it’s cold outside, so come on in and explore winter weather inside! Measure the frigid winter wind with a DIY windsock, make your own crystal snow flake, and watch a mini blizzard up close. Then, make a cloud identification chart and a weather dial that you can use all year long! Friday, December 28– Santa’s Navigation: The Night Sky – Come discover what Santa sees in the winter night sky with our STARLAB planetarium and a visiting astronomy expert from the Kalamazoo Astronomical Society. Create your own constellation and stained glass planets to take home and enjoy. Wednesday, January 2– Fascinating, Fantastic, Fun Flight – Have you ever looked at the sky and wished you were up there? Are you interested in things that fly? Learn about aircraft and build your own that glides like a bird and soars like an airplane! Design and experiment with your own take-home gliders, kites, airplanes and more! Thursday, January 3– Winter Carnival – Experience the thrills and chills of a lifetime while testing the true power of energy, the laws of physics, and the fun involved when you put forces in motion! Families and kids of all ages will demonstrate amazing feats of strength and agility while interacting with a strongman hammer challenge, flying frog lever machines, a piloted hovercraft device, and Isaac Newton’s inertia carts. Friday, January 4– Explore Your Tiny World – Have you ever wondered about life at the tiny scale? Imagine yourself as small as a red blood cell with a fun game. Spy on real “yeast-y beasties” with a microscope. Make your own “fun guy” (fungi), bacteria, or virus to take home. Write your name in DNA code and more in this day of appreciating the truly tiny things in life! Try Something New for Winter Break! Winter Break is a great time to go somewhere new. Drive over to Feel It Fridays at Forever Curious Children’s Museum in Fennville, and let your child learn through sensory play. Or check out Kids, Crafts and Critters at Coopersville Farm Museum, where you can please both the artist and animal lover. Has it been a while since you’ve spent a day in downtown Grand Rapids? Start with a stop at the Grand Rapids Public Library. Find new reading material for the whole family to enjoy over Christmas break. And, if you happen to be there on a Saturday, check out one of their fun and educational events, Block Party or Mindstorm Saturdays. Next grab a bite to eat (and give yourself time to explore) at the Downtown Market. Check out 15 Things to Do At the Downtown Market with Kids to make sure you don’t miss a thing during your visit. Finish the day Ice Skating at Rosa Parks Circle, the perfect way to end a winter day in GR. Visit Holland Community Aquatic Center for loads of fun with your whole family! Little ones love the splash zone with tumble buckets, water features and a slide. The Alpine Challenge, Aqua Track, Zip Line and 150-foot water slide are the play features for the older kids! Winter Break hours begin December 26 and run through January 4. Weekday hours are 12-4 PM and 5-8:30 PM. Come all day for just $8.50 per person! We’ll see you in the pool! Call ahead for details. Age and height safety requirements apply to some features. Winter break is a great time to check out a game with your sports enthusiasts. You can find both the Grand Rapids Griffins and the Grand Rapids Drive with home games over Christmas break. And if you are looking for plans for New Year’s Eve, check out the Grand Rapids Griffins New Year’s Eve FIREWORKS Celebration PROMO CODE DEAL. Enjoy a special night out, cheering on our Griffins and then stay for an indoor firework display after the game. Be your kids biggest fan! Sign up your little basketball player in the Holiday Hoops 3on3 Basketball Tournament and cheer their team on to victory. • Buffet with menu featuring salad, pasta, pizza, dessert and beverages. Craig’s Cruisers offers fun for all ages. Contact us or visit our website to learn about our specials and packages! Check the events calendar for even more fun things to do on winter break! Looking for something to do on a specific day of winter break? Use this calendar of winter break events to find your fun!